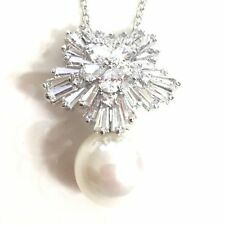 This is a very shinning and highest luster simulated huge Akoya white pearl pendant. The pendant is made from 14K GDP, stunning with lots of excellent cut lab diamond and simulated 12mm Akoya large pearl. Metal: White Gold PlatedStyle: PendantLength: Less than 13"
This is a real luxury white Akoya pearl with heart shape lab diamond pendant necklace. The pendant is made with stunning lab diamonds. The beautiful diamond setting make the pendant a real gorgeous accent. Metal: White Gold PlatedStyle: PendantLength: 18 - 19.99"